Hidden and double meanings abound on the record. 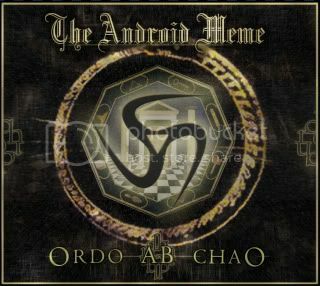 For example, Ordo Ab Chao, which roughly translates to “order and chaos” (or order from chaos), is also an appropriate description of the band’s music. By working in various musical styles, The Android Meme has created its own artistic identity. Ordo Ab Chao certainly offers something for everyone. Listeners will hear influences of TOOL, GENESIS, PETER GABRIEL, TEARS FOR FEARS, DEPECHE MODE, MÖTLEY CRÜE and RUSH. Audio samples are available here.